Personalized Dog Memorial Stone With Leash..
Home > Pets > Pet Memorial Stones > Personalized Dog Memorial Stone With Leash.. 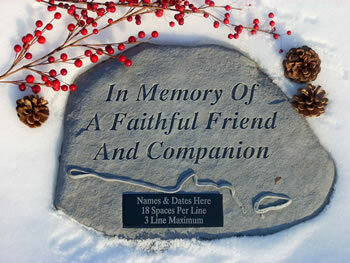 This beautiful pet memorial stone can be personalized. Cast into the stone are a leash and collar. The memorial stone has a rich texture with the look, feel and weight of true stone. Made of cast stone, it is weatherproof and has year-round durability. 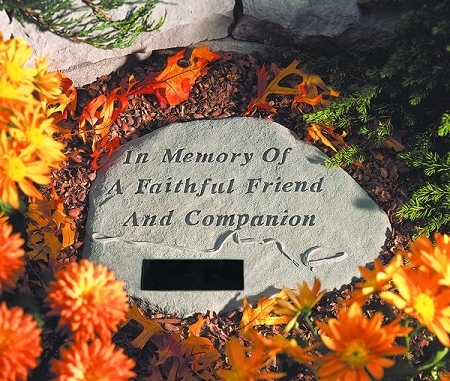 Inscription: "In Memory of a Faithful Friend and Companion"
Personalization: Up to 3 lines of 21 characters per line can be etched on the black marble plaque. This was perfect! Our Abbie loved her leash! Nice stone.